On January 13th I turned 28. To celebrate – or, rather, ease the sting of inching another year closer to 30 – I left behind Portland snow for tropical sand, and got on a flight to Kona, Hawaii. Though we booked this Hawaii trip in December (not even a full month prior) the wait was brutal. Portland was experiencing the coldest winter it had seen in decades, and we left the city buried in a foot of snow (the Uber ride to the airport was fuuunnnn). Prior to this trip, I had been to all of Hawaii’s major islands except the big island (properly referred to as Hawai’i Island). So I was excited to explore another side of Hawaii, and spent the weeks leading up to my vacation researching things to do, restaurants, beaches, etc. 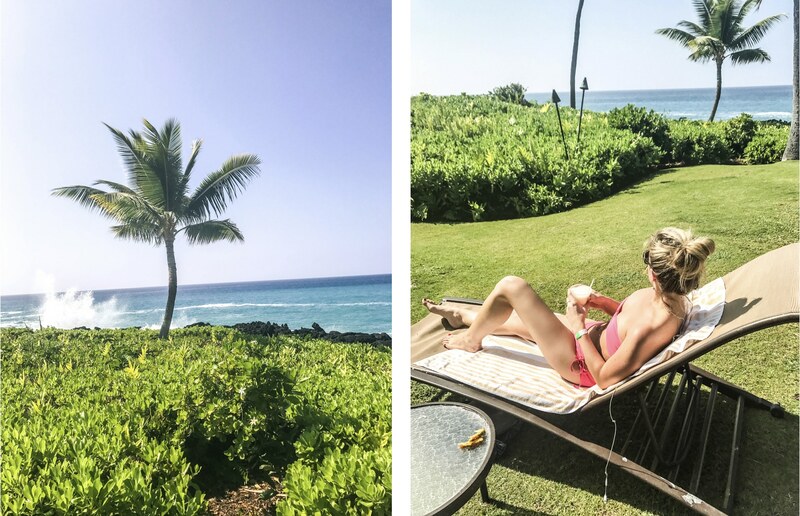 We spent a little over a week on the big island and to say we crammed a lot into those seven days is an understatement. However, I believe we found some of the best things the big island has to offer, and I wouldn’t change a thing. 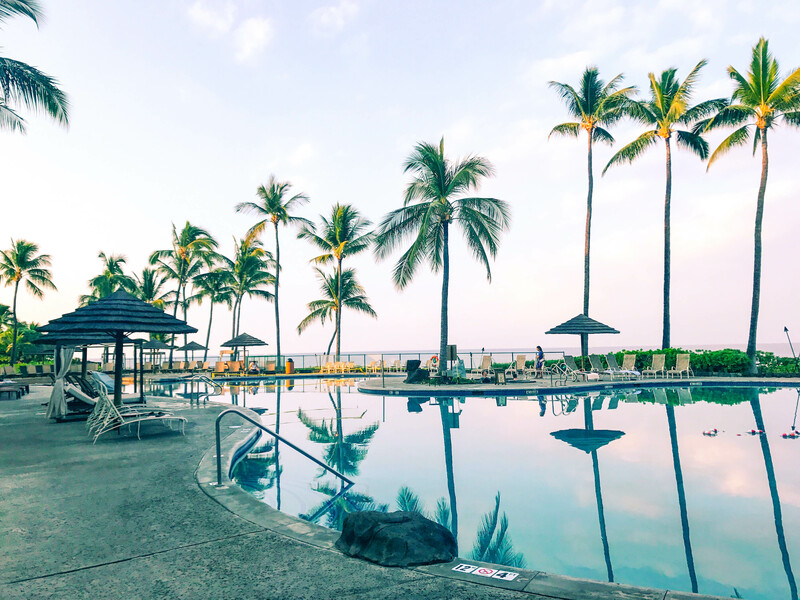 We stayed at the Sheraton Kona and spent the first day of our trip lounging by the hotel’s oceanfront pool, throwing back Pina Coladas, and nursing jet lag. The pool area was large and featured numerous lounge chairs and cabanas facing out towards the ocean. After a relaxing day at the resort, we set out in search of a beach to watch the sunset. 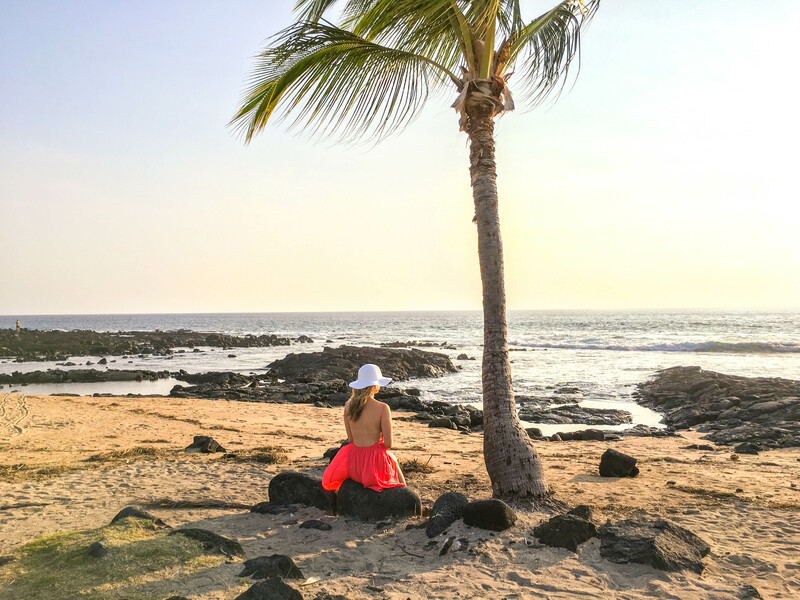 We settled on Old Kona Airport Beach Park, and were not disappointed. We chose the beach, initially, due to its close proximity to Kona. 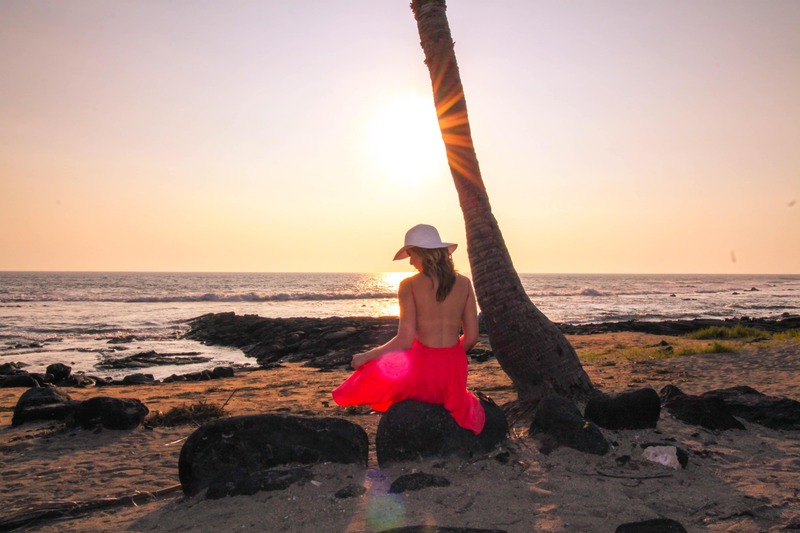 While the beach was only a 10-minute drive from downtown Kona, it ended up being (almost) completely deserted and was exactly what we were looking for. After watching the sunset, we ventured into Kona to meet my sister and some friends (who happened to be visiting at the same time) for dinner at Huggo’s. 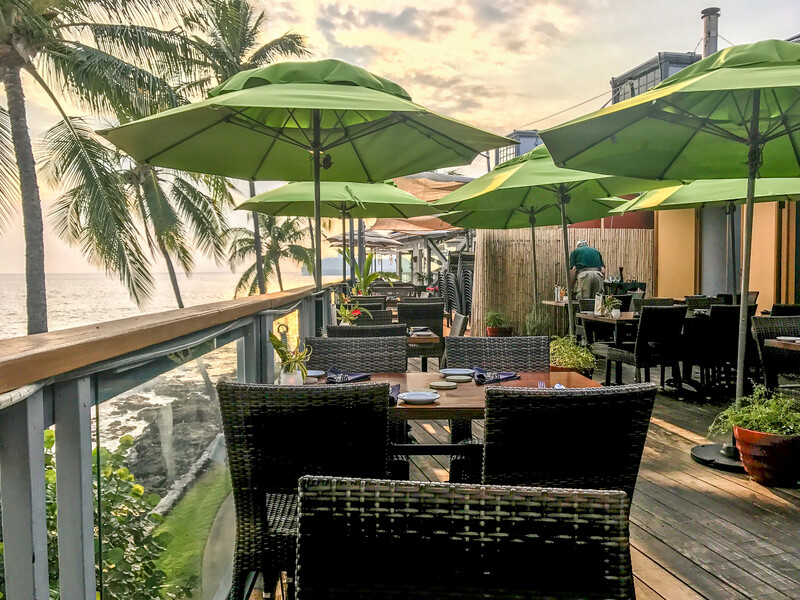 We chose Huggo’s mostly for the outdoor dining / ocean view, and I loved the restaurant’s ambiance. I had the lobster tail and it was delicious. My only complaint about our dining experience was the service being extremely slow. However, I would still recommend this restaurant to anyone visiting Kona. We kicked the day off with breakfast in Kona at Daylight Mind Coffee Company, which I cannot recommend highly enough. Though most of the nearby restaurants were crowded with waiting lists, Daylight Mind was fairly slow and we were able to get a table immediately. Tucked behind several shops the cafe is situated slightly off the main street, and I liked that its somewhat hidden location seemed to deter most crowds. We even scored a table on the balcony overlooking the ocean. I had the avocado smash and it was delicious. After breakfast we returned to the Sheraton and spent the afternoon by the pool. Once I was sufficiently sun-kissed we left the hotel to catch a sunset happy hour at Sam Choy’s Kai Lanai. The view was gorgeous, the mai tai’s were good, the Poke – unfortunately – was just okay. However, the atmosphere was what made the experience. 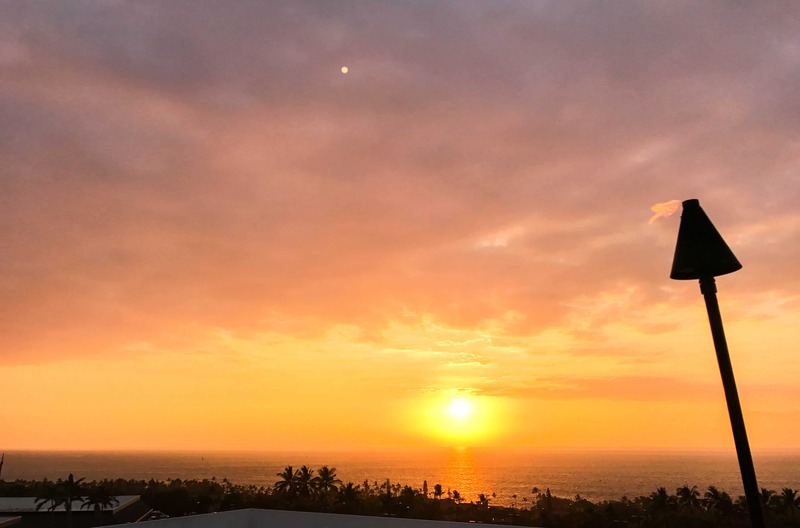 There was live music, so we were able to listen to a man play the Ukulele and sing all the classic beach tunes while we sipped mai tai’s and watched the sunset from the elevated outdoor balcony. It was the perfect way to end the day. After happy hour we had dinner at Amici Vista Grill. 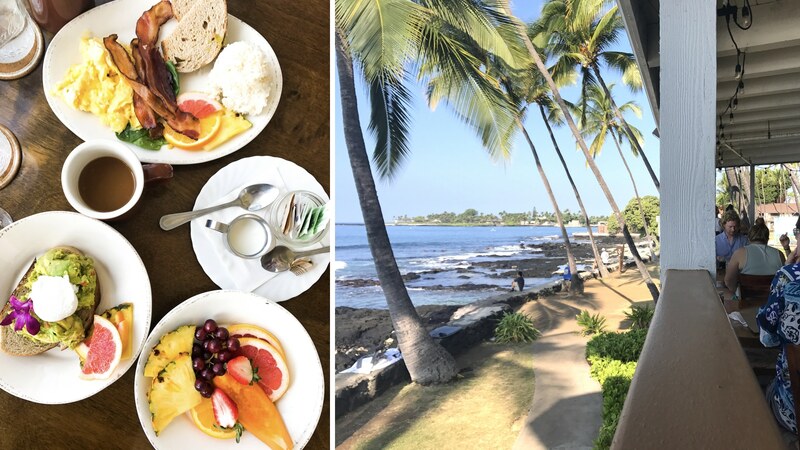 The restaurant is located on the grounds of the Kona Country Club and boasts beautiful views of the ocean and surrounding golf course. The menu features a fusion of Mediterranean and Italian cuisine. The portions were big, and I really enjoyed the food. Once finished with dinner we made our way back to the Sheraton for a nightcap at Ray’s cafe. The open-air bar/restaurant is named after the manta rays that frequent the bay. The mantas come out at night and the hotel turns on its flood lights so you’re able see the mantas in the water. At first I couldn’t figure out why I wasn’t able to see anything, but the bartender explained that you’re only able to see the mantas once the diving boats leave the bay (the mantas are attracted to the light, so they stay by the boat lights while the boats are there, then come to the hotel lights once the boats leave). Sure enough, once the last boat had left, the mantas came right up to the hotel bay and were easy to spot in the water. It was so cool to see them breaching the ocean’s surface, and it made me wish we had booked an evening manta snorkel/dive tour. Today we set out to explore the island. 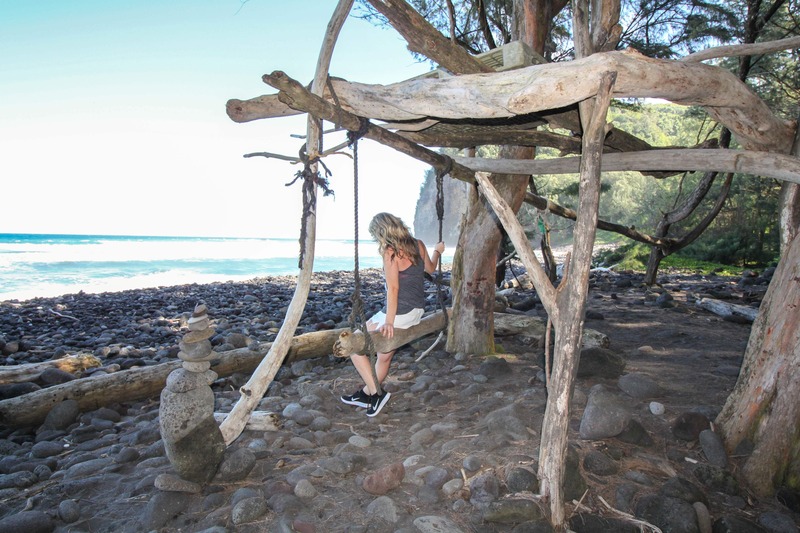 We made our way north to Pololu Valley to hike Black Sand Beach. 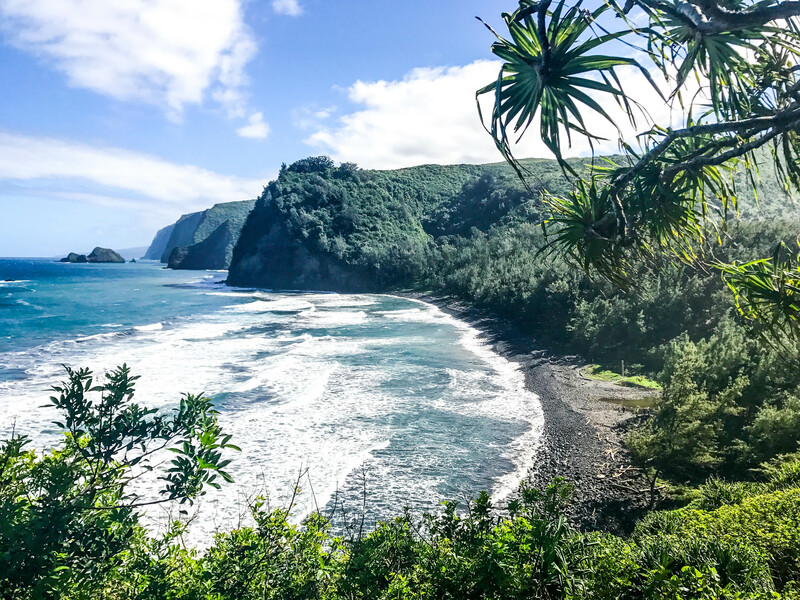 Located at the northern most point of the island, Black Sand Beach is about a 1.5 hour drive from Kona. The trail to Black Sand Beach begins at the famous Polulu Valley Lookout, so parking was a little tough as there were numerous other tourists visiting the viewpoint. Despite the crowds, I was happy to discover that most people didn’t actually make the trek down to Black Sand Beach. It took us about 15 minutes to hike down the trail and, once we arrived, we found the beach mostly empty. The beach was large, rocky and beautiful. The hike down was rocky, but fairly easy. The hike up, on the other hand, took us about 30 minutes and was definitely a workout! During this hike (and subsequent ones) I noticed numerous locals hiking the trails and walking the rocky beach, barefoot. Evidently barefoot hiking is a thing in Hawaii? By the time we reached our car at the top of the Polulu Valley Lookout, it was just after 3pm and I was famished! We were on a mission to find food and b-lined towards a little town called Hawi that we had passed on the way in. Using Yelp, I found a place called Kawaihae Kany’z that had glowing reviews and – more importantly – Poke. Still sweating from the hike, we parked on the street and walked up to the small service window only to find (to my HUGE disappointment) that it was closed on Mondays. Saddened, but still starving, I quickly reverted to Yelp to find a place nearby where I could get a beer and Poke. I found another nearby restaurant called Sushi Rock. We walked there only to discover that they, too, were closed (they close between 3-5pm). By this point, I didn’t care about Poke, I just wanted food. So we tried another nearby restaurant, Bamboo Restaurant – Closed, then Kohala Village HUB – closed. EVERYTHING was closed. After roaming Hawi looking for food proved unsuccessful, we got in the car and made our way back towards Kona, hoping to find something else along the way. About 15 minutes from Hawi was another little town called Kawaihae. Though the town had about 5 eating establishments, all of them were closed on a Monday at 3:30pm. All of them, but one: Seafood Bar & Grill. Located across the street form a concrete plant, the restaurant is painted green and doesn’t look like much from the outside. Admittedly, had I not been STARVING we probably would’ve just drove past. However, I’m so glad we stopped. The bar was filled with locals, and we happened to arrive during happy hour (hello, $5 Mai Tai’s). We ordered the poke and the coconut shrimp, and both were absolutely delicious. This place is definitely a hidden gem, and I highly recommend it if you ever find yourself driving through north Hawai’i Island. This was one of my favorite days on the island. We woke up early and drove 45 minutes to the beautiful Hapuna beach. Hapuna beach was voted among the best beaches in the world, and is (in my opinion) the best beach on the Big Island. 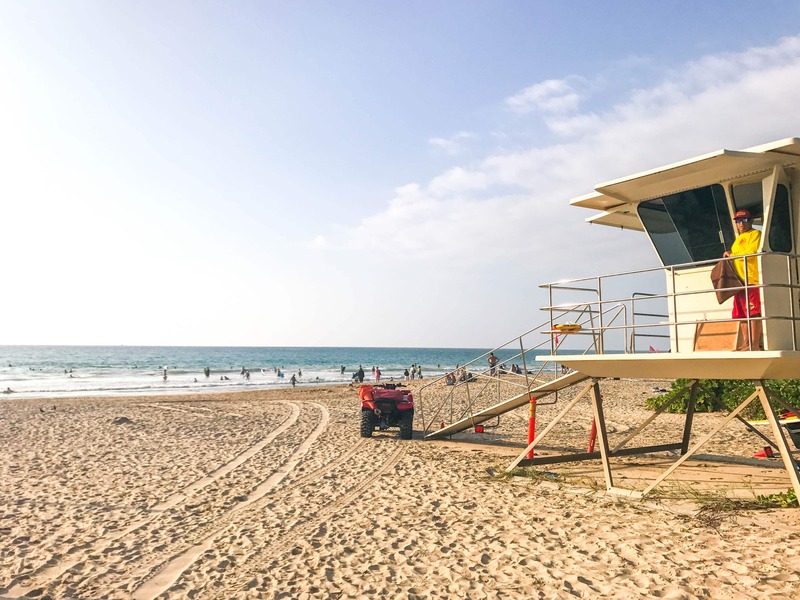 It is a 1/2 mile-long white sand beach that’s almost always sunny and has a continuous shore break, making it safe and easy to “play” in the ocean. There’s a professional lifeguard on duty and the beach is lined with trees if you want a break from the sun. There is a $5 parking fee, but don’t let it deter you. This beach is a MUST for anyone visiting the Big Island. 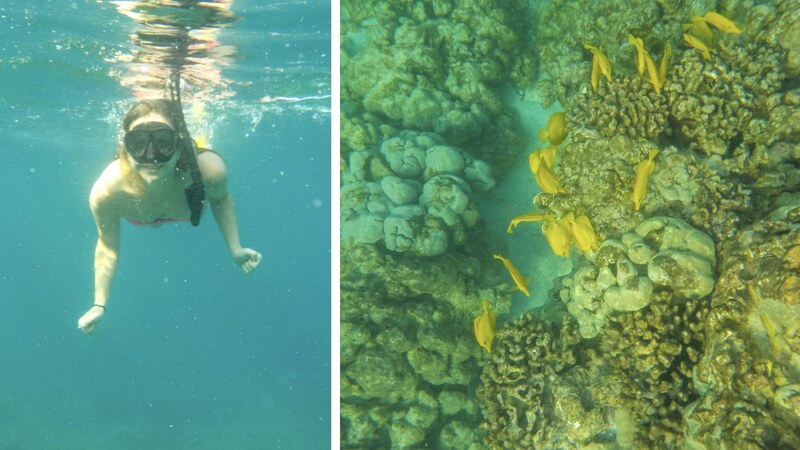 We had a whale watching tour booked for that afternoon, so after a few hours channeling my inner child and playing in the water, we (reluctantly) made our way from the beach to Waikoloa. Before the tour we had lunch at Lava Lava Beach Club in Waikoloa village. This was one of my favorite restaurants because it had great atmosphere and great food. The oceanfront restaurant offered outdoor seating so you could eat with your feet in the sand. I had the fish tacos (which were amazing) and a mai tai – which was arguably the best mai tai I had during my trip. After lunch we walked over to Hawaii Ocean Sports to meet the whale watching tour. When we were planning the tour, there was a lot of back and forth among our group regarding which tour operator to go with. 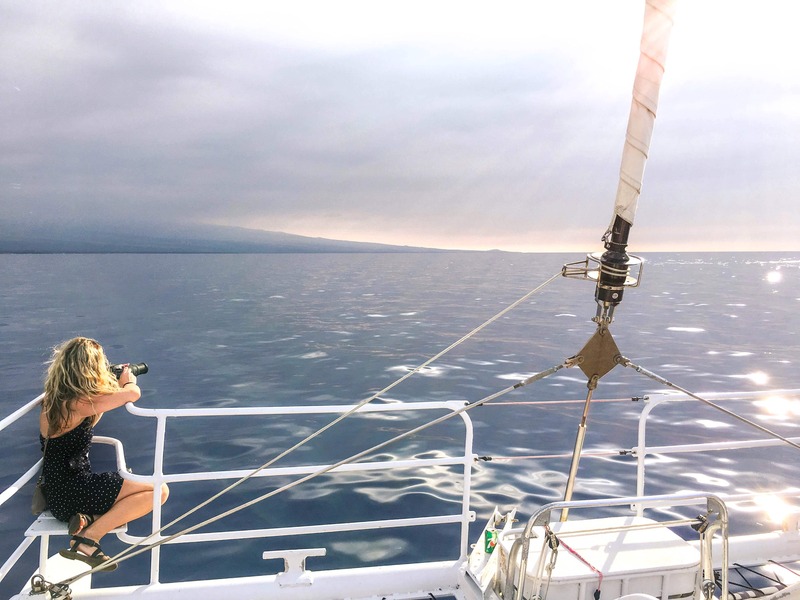 We ultimately decided on Hawaii Ocean Sports’ “Sail with the Whales” tour because they had an open bar on the boat (priorities) and because the tours were on a catamaran sailboat, so the groups were smaller (14 people max). There was also a very knowledgeable naturalist onboard who was a great resource for answering questions and teaching us about the whales. I definitely think we made the right decision and would highly recommend this company. The two hour tour began fairly uneventful. A spout here, a tail flap there. I remained perched at the front of the boat with my camera in hand, ready to shoot. Things had been silent for several minutes, and I was mid-conversation when I heard everyone to my right gasp. 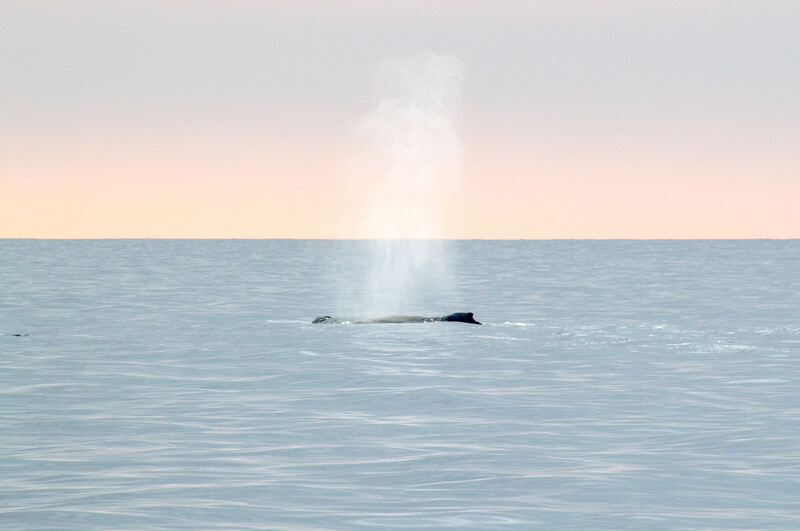 I turned around in time to see a whale BREACH 30 yards from the boat. 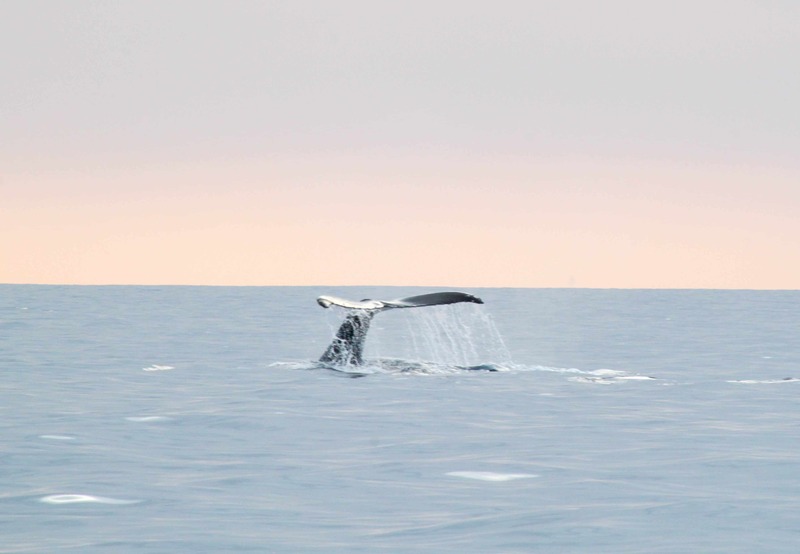 I was so shocked by the sight of this huge animal flying out of the ocean that I nearly forgot about the camera in my hand. I brought it up and took a picture just as the whale splashed back into the water. I ended up capturing a picture of the huge splash – rather than the breaching whale (as I had hoped). Regardless, I have the picture in my memory and seeing that up-close was an experience I will never forget. This was definitely a highlight of the trip. After whale watching we drove back to Kona and had dinner at On The Rocks (which is the sister restaurant to Huggo’s). While we were waiting for a table we sat next to a gentleman at the bar who ended up being one of the owners. He bought us mai tai’s and gave us recommendations on his favorite dinner items (the burger and ribs). Once we were seated, I ended up ordering the beef fried rice and it was SO good. Ultimately, I liked On The Rocks better than its sister restaurant, Huggo’s. If you’re in Kona, I highly recommend it. 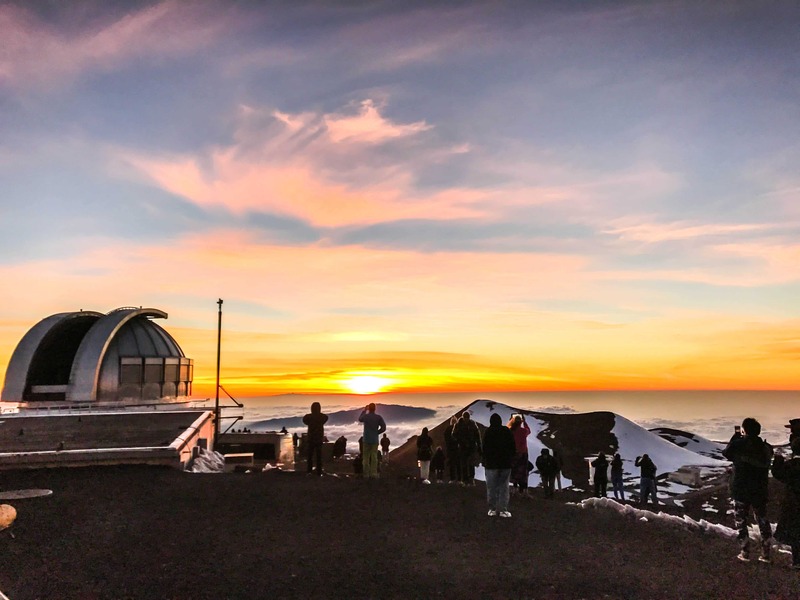 Today we had scheduled a Mauna Kea Summit & Stargazing tour. 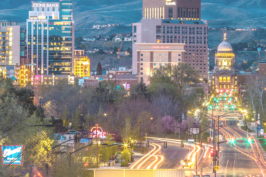 This was something our group really wanted to do, but I was initially skeptical. I don’t necessarily harbor an affinity for astronomy and a 7-hour tour seemed like quite the commitment. However, after reading numerous glowing reviews, we decided to give it a go. 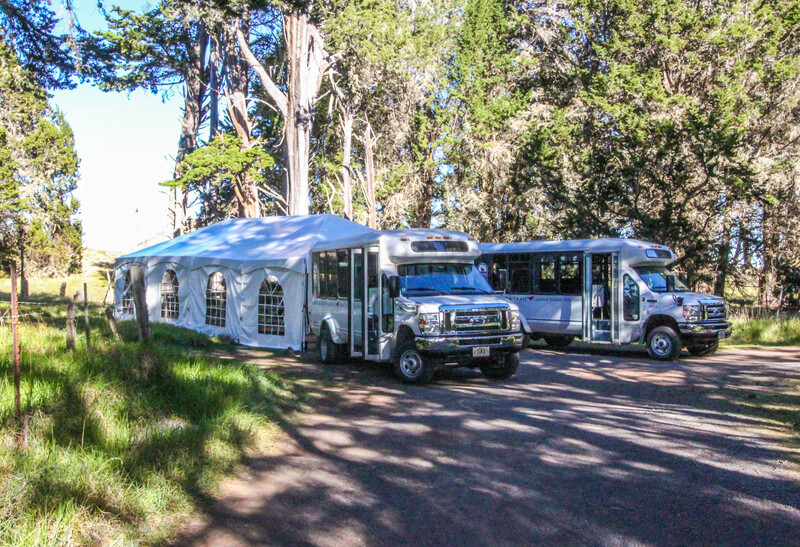 We met the tour at the Forest Center at 1pm, got on the bus, and began the 2-hour drive towards the summit of Mauna Kea. Our guide, Nate, was extremely knowledgeable and knew everything about everything. I learned so much about the history of Hawaii, the flora and fauna of the island, Hawaiian culture and folklore, etc. After dinner we were back in the van making our way towards the summit. Once you pass the visitor center, the road turns to dirt and only 4×4’s are allowed (which is why we opted for the tour, rather than driving to the summit ourselves). In less than an hour, we climbed another 7,000 ft and got to the summit around 6pm – just in time to watch the sunset. 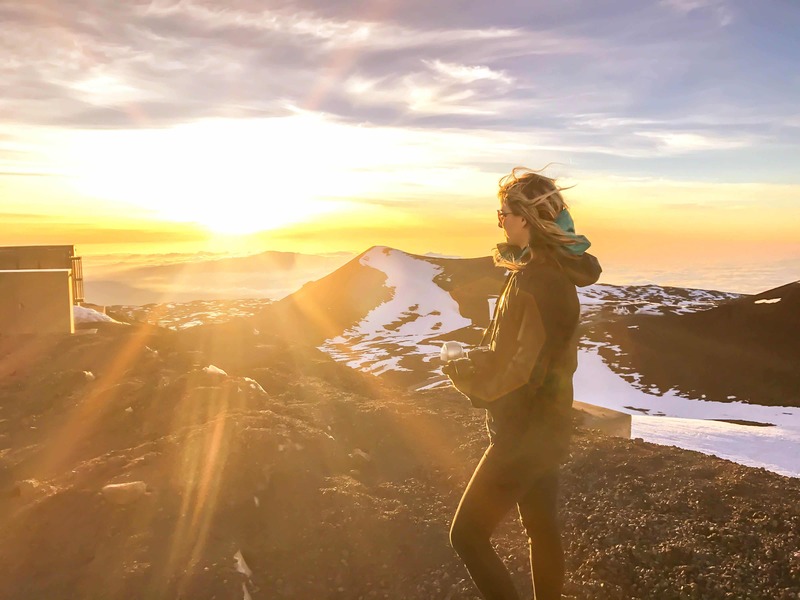 Reaching 14,000 ft in elevation, the summit of Mauna Kea is the highest peak in the pacific, and the view was absolutely awe-inspiring. Nate gave us parkas and mittens, but even with the extra jackets, it was SO cold due to the heavy winds. There was snow on the ground around us and the temperature was below freezing, which made it easy to forget I was in Hawaii. However, it was worth it to see the otherworldly scene of huge telescopes surrounded by lava rocks and volcanic landscapes. Today, we woke up bright and early to go snorkeling with dolphins. 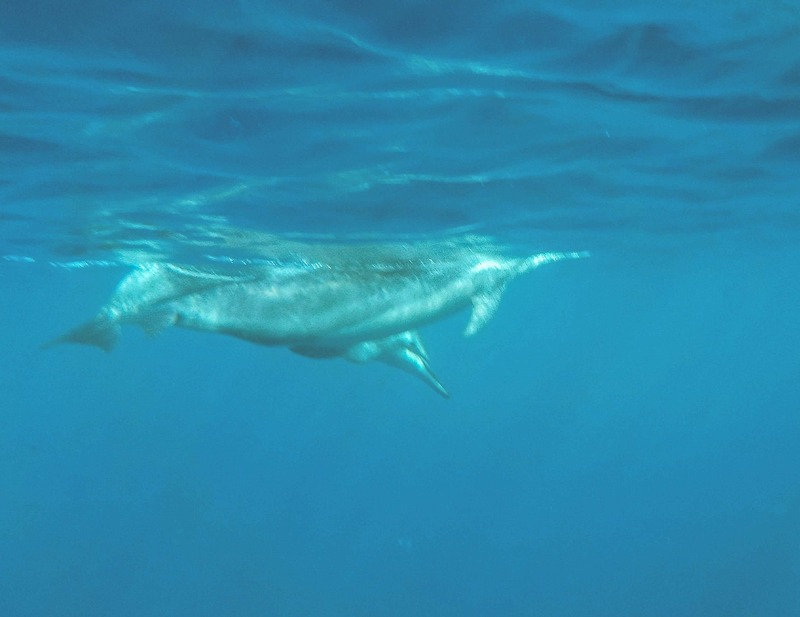 We heard of a great beach nearby called Pae’a, and the naturalist on our whale watching tour said if we got there in the morning we may see dolphins in the cove. The chance to swim with (non-captive) dolphins was enough motivation to get me up and going at 7:30am. 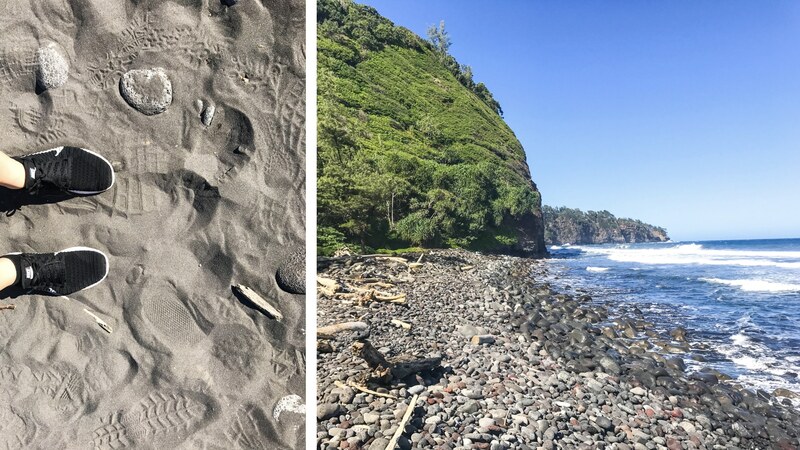 Located in Captain Cook (just south of our hotel), the beach is referred to as “Two Step.” The area is fairly small, and consists of more rocks than beach, but since we arrived early it wasn’t too crowded. It didn’t take me long to discover the best way to enter the water was by using a rock on the far left side of the beach that formed two natural “steps” into the ocean (hence the name “two step” beach). Once in the ocean the snorkeling was amazing, but what made this experience were definitely the dolphins. Sure enough, upon entering the water I noticed a pod of dolphins swimming around out in the bay. Unable to contain my excitement I swam out to them at a pace comparable to Michael Phelps. Once out in the bay, the dolphins would come close enough to touch (I didn’t touch them, just observed). 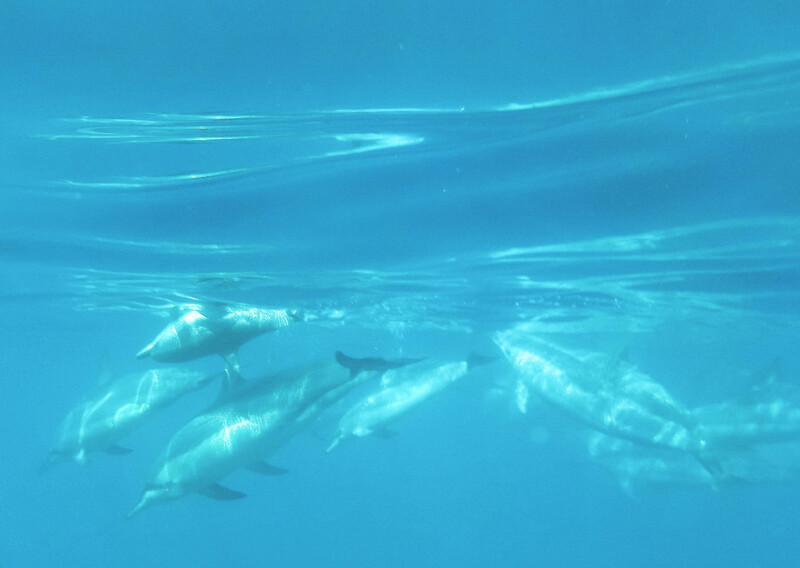 It was so amazing to float on the surface and watch the dolphins swim around me. This was definitely a highlight of the trip! 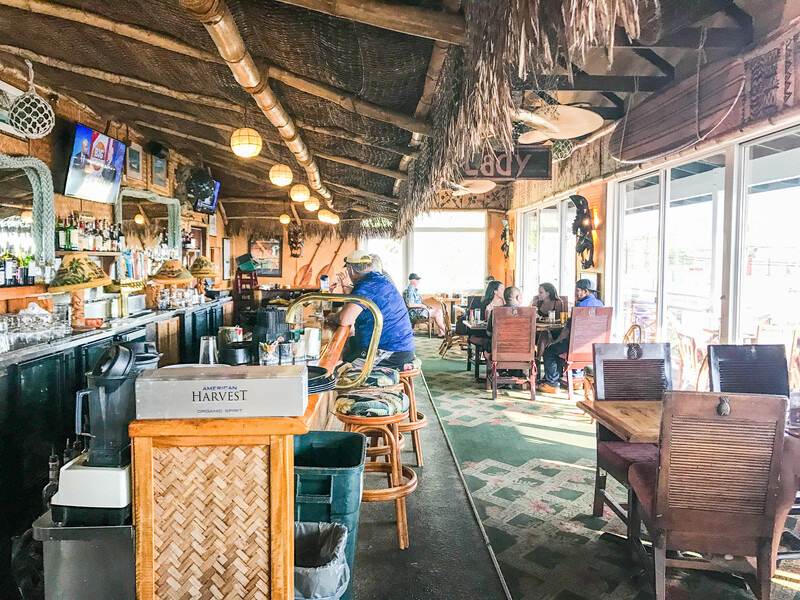 After a few hours of snorkeling we had worked up an appetite, so we made our way to Captain Cook and had breakfast at a lovely little spot called The Coffee Shack. 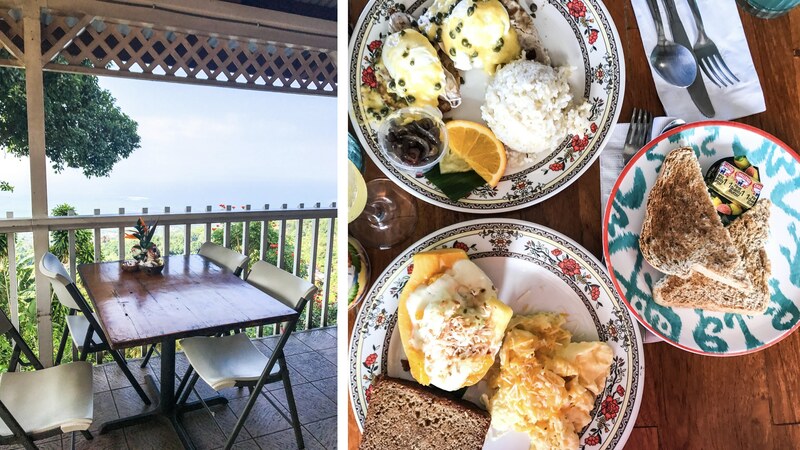 The small cafe boasted a beautiful view of the ocean and the food was to die for. I had the Papaya special, and absolutely loved it! I realized that I had been in Hawaii for almost a week and hadn’t yet had Loco Moco! Therefore, that became the mission of the morning. 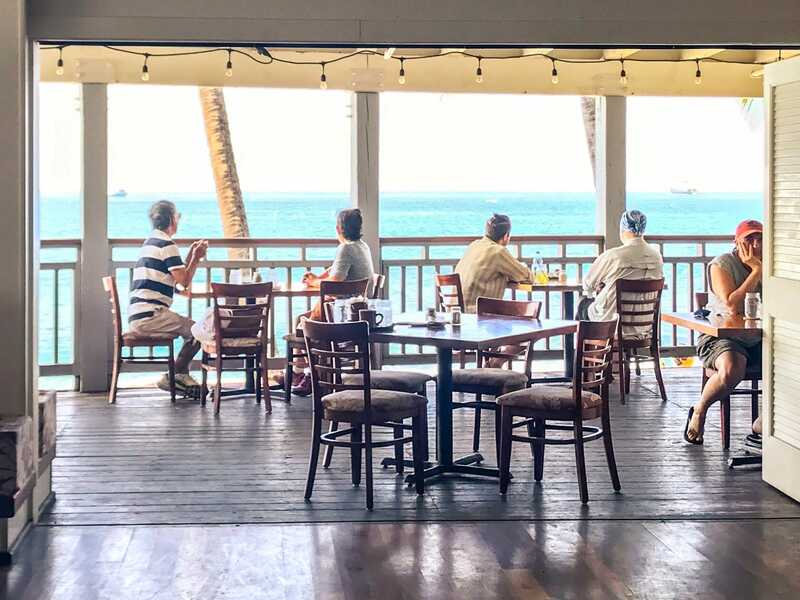 We ventured into Kona for breakfast and sought out a place called Bongo Ben’s Island Café. I ordered the Loco Moco (with fried rice, just to make it extra unhealthy) and the meal definitely lived up to the reviews. After breakfast, we went to Kona Brewery. We sat at the bar and ordered a flight of beer. My flight consisted of lighter beers (blondes, lagers, etc.) and a couple of porters and stouts. I was pleasantly surprised at the large selection of beers, and enjoyed most of the ones I tried. Later that afternoon I had an appointment at Ho’ola Spa at the Sheraton. Since it was my last day on the island, the spa was was a perfect way to ease the stress of my impending departure. I booked a facial and it was absolutely heavenly. They used organic, nutrient rich serums and lotions during the 90-minute session, and my skin was glowing for days after. The spa also recently introduced Hawaii’s first Himalayan Salt Room, so I was able to relax in the salt room for a while following my facial. That night, we had our “last supper” at a beautiful Italian restaurant in Kona called Mi’s Waterfront Bistro. 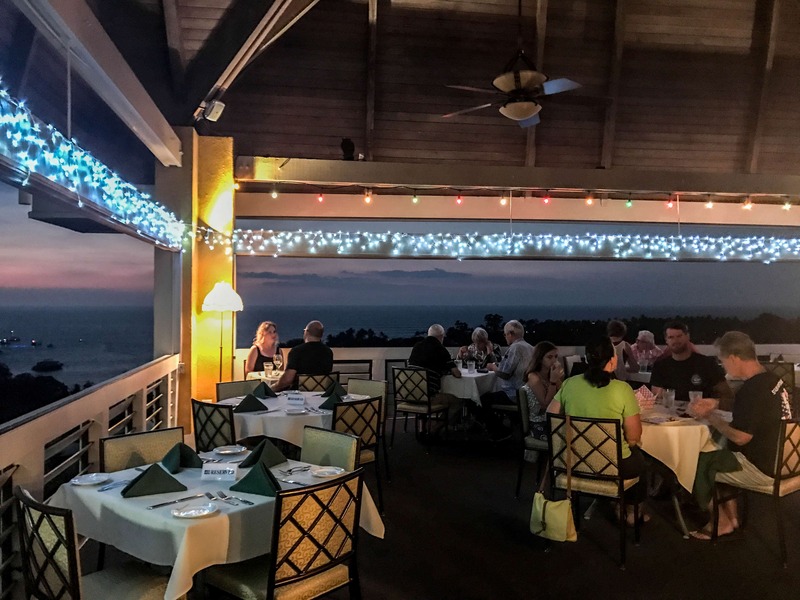 The restaurant boasted a large patio with beautiful views of the ocean. This was another one of my favorite restaurants while visiting Kona. The food and view were both spectacular and the service was great. We arrived early enough to enjoy dinner while watching the sunset, and I couldn’t imagine a better way to end our vacation. I’ve only been to Kauai but I definitely want to go to the big Island! Your trip looks amazing! 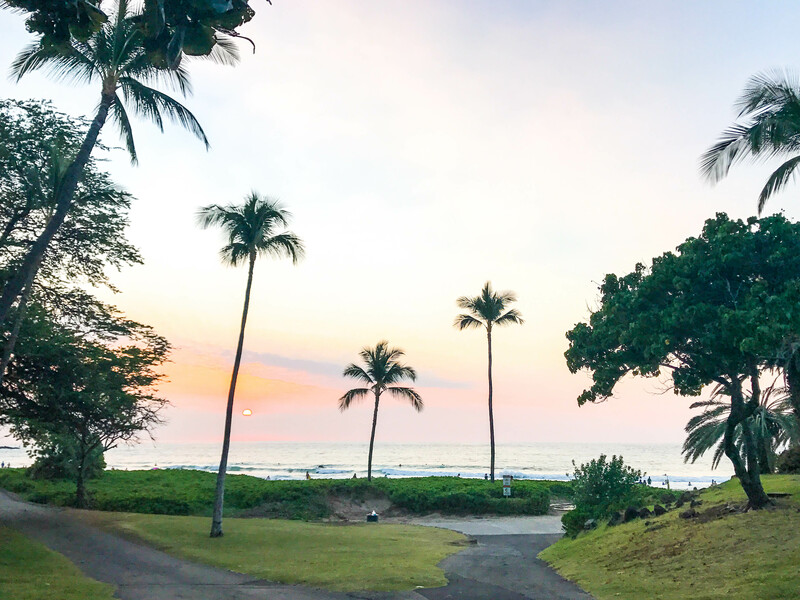 Oh man, your pictures are amazing and make me totally miss Hawaii! It really is a magical place. Thanks for sharing your trip! WOW, that sounds like a wonderful trip!! 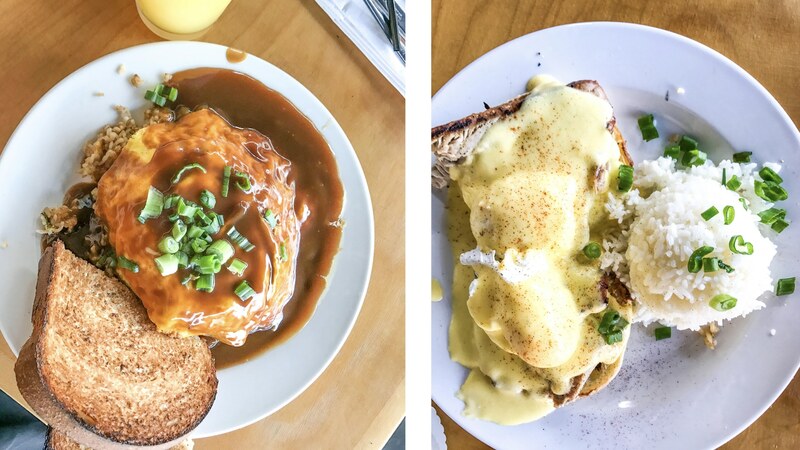 Our experience in Hawaii (Oahu) was a lot of chain-quality food and not a lot of character in Waikiki, and felt a little limited on the rest of the island–but still loved our time there. 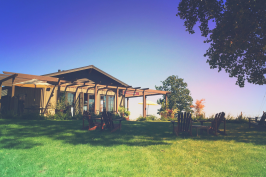 I can’t believe the weather differences you experienced, and all that wildlife–OMG!!!! 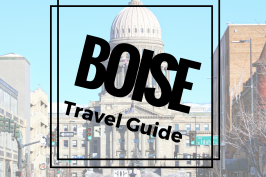 Your post and pictures are seriously giving me the travel bug! Hawaii is very high on my bucket list. How beautiful! I visited Hawaii years ago – definitely time to plan a trip back! Your photos are making me want to hop on a plane right now! 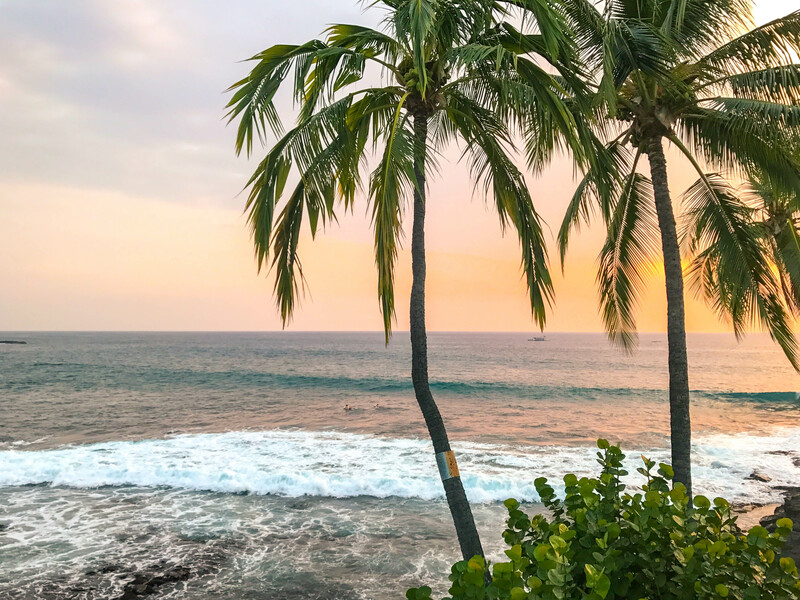 What a great summary – when I’ve stopped at Big Island it was mainly for Volcano Park and my DH has always been curious about staying at the Kona side. 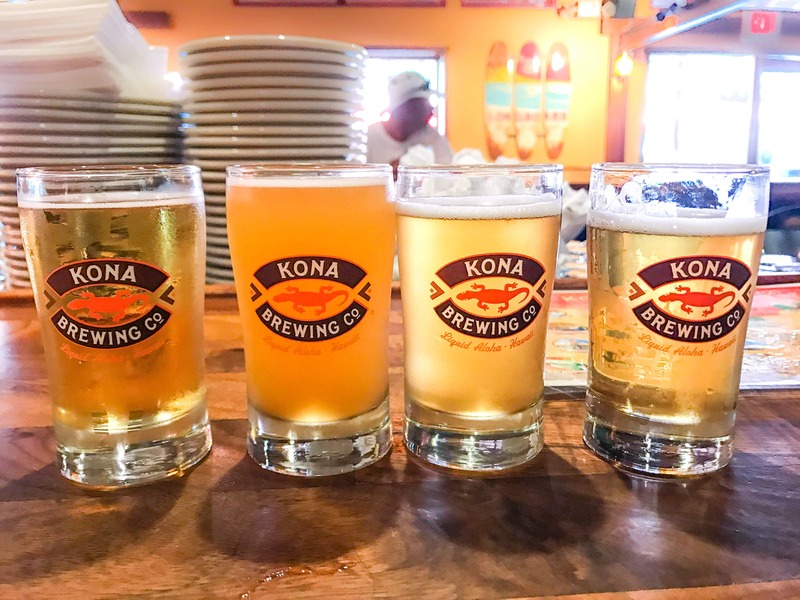 I think it is partially because of Kona Brewing though! These pictures are incredible! Hawaii is just the best, I could really use a trip there right now and get out of this cold-ness haha! I’m working on planning a trip back there and I can’t wait! Omg! Can’t even handle the beauty…your pics are gorg, so stunning…it’s hard to even imagine! What a fab b day celebration..,obsessed with swimming with the dolphins! Feel like I got to go along-almost. Lol! Love this =) We plan on visiting within the next year or two! Saving this for future reference! Looks like you had an amazing time! Keeping this for our next trip! Your photos are absolutely stunning! I can’t wait to go to Hawaii some day, it’s the perfect paradise without having to leave the US! LOVE this post! We spent a few days on the Big Island and loved it. Hapuna Beach is super. Loved Hawi as well, as it is so quaint and unexpected. We ate at the Bamboo Restaurant you mentioned and it was great. I’m so glad I found your post, we’re heading to the big island in the next few weeks. Your photos look amazing, I didn’t think I could get more excited about the trip but I was wrong! :). And as a fellow arachnophobe I feel your spider pain. Thanks for the tips on the dolphins as well, I didn’t want to book a formal tour that many people feel are detrimental to the dolphins but I would so love to see some in the water. I really enjoyed reading your post. Im leaving to the big island in two weeks. Thanks for the great ideas. I especially can’t wait to swim with the dolphins too. Thanks for all the great tips. 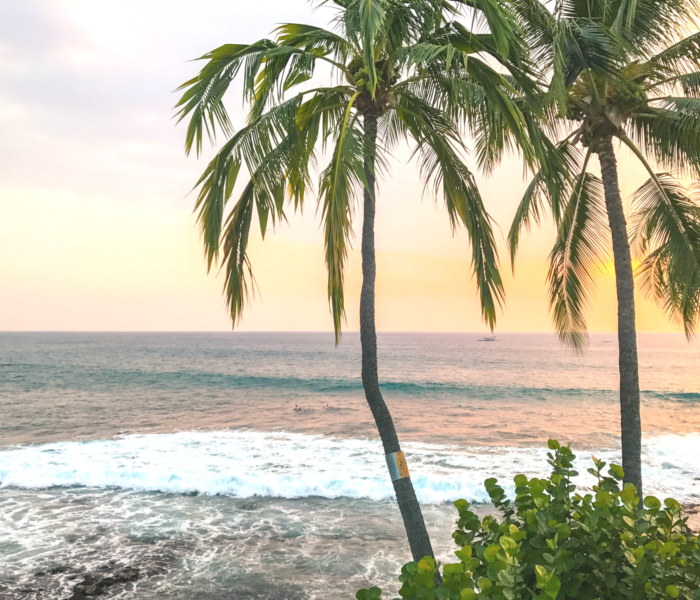 Thanks, you helped convince us that Big Island is a must do on our trip – and the extra information about Mai Tai’s is an added bonus. Great post. I went to the Big Island but have not checked out the Mauna Kea yet. It looks so surreal under the sunset I definitely need a return trip, but so much as you, I will go on a group tour, not just for the sunset, but for stargazing also. I have looked at the pictures of the Milky Way that was taken by my friend at the summit and it is absolutely breathtaking. We have been to the Big Island many times (7?). You hit many of our favorites! We usually rent a condo and go for 2 weeks or more. We obviously don’t eat out 3 times a day for two weeks but always go out a few times. We are in Hawaii now and plan to try a couple of your restaurant recommendations. We had a beach spot at Huggos on The Rocks last year on the 4th of July! It was incredible! If you make it back, try Mauna Kea Beach, Hupuna was my favorite until I went there. 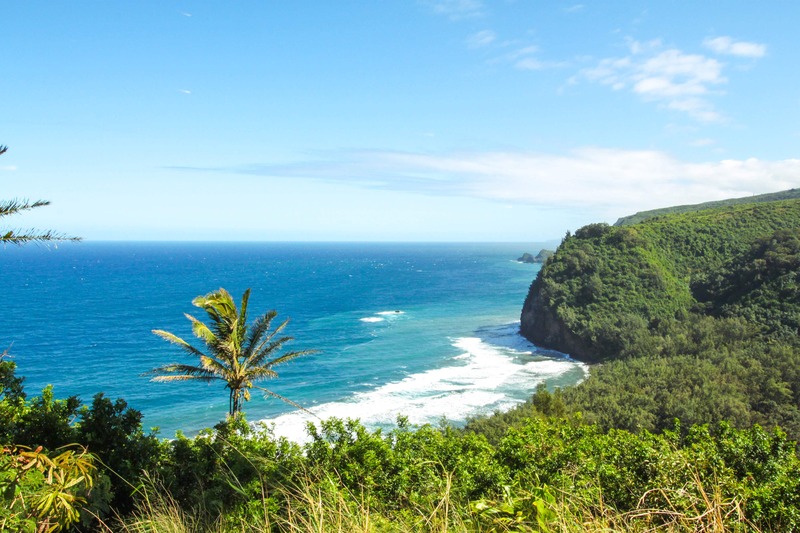 We also love Manini’owali Beach and Waialea Beach (usually referred to as Beach 69-due to its location at mile marker 69). You’re photos are beautiful, great post! Aloha! Sorry, the teacher in me had to reply to my grammar error! For an incredible spa experience, visit Mamalahoa Hot Tubs & Massage after a morning of snorkeling at Two Step. Beautiful teak hot tubs in outdoor tiki huts, all in tropical rainforest setting. Amazing. Referred by local bartender. http://www.mamalahoa-hottubs.com. For an incredible spa experience, visit Mamalahoa Hot Tubs & Massage in South Kona after a morning of snorkeling at Two Step. Beautiful teak hot tubs in outdoor tiki huts, all in tropical rainforest setting. Amazing. Massages the best ever. Referred by local bartender. http://www.mamalahoa-hottubs.com. Thank you for your helpful post. I am looking to plan a private elopement and trying to decide on a small island or the main island. Listen to this gal. This is a perfect week on the Big Island. Having lived on the island for 6 years and experiencing everything she posted, I must say she did an excellent job while enjoying a splendid week there. Follow her travels and you can’t miss a blissful week on my favorite Island.